Every year, the Association conduct the KMAT exam. Likewise every year, this year also it conducted the exam for the eligible and interested candidates. This year, the association held the exam in the month of May and July. The results of the exam which were conducted on 29th May 2016 has been already made visible to the applied candidates with their scoring marks. Thousands of candidates applied for the exam across various examination centers. The association timely releases detailed notifications for the convenience of the candidates. Now according to latest updates, there came up a conclusion that the results of the examination conducted in the month of June are about to be out within few hours itself. The applied candidates must keep an eye on the website to know information regarding the declaration of results. 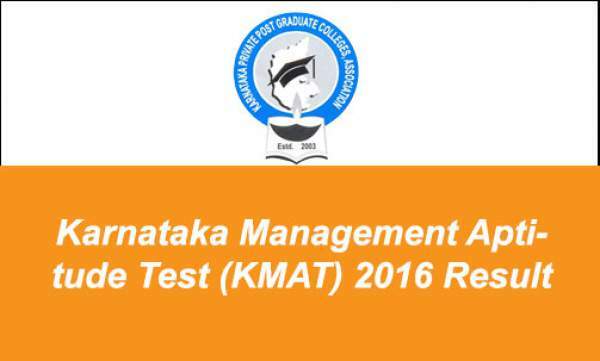 The KMAT exam aims as making the candidates eligible enough to take admission in different post graduate management courses in various private PG colleges which are officially placed in Karnataka. The paper was made by multiple choice questions (MCO’s) which include a total of 120 questions. The paper includes some knowledge regarding the following subjects like Verbal Reading and Comprehension, Logical Reasoning and Quantitative Ability. The applied candidates were required to be well prepared for the examination and should enhance their knowledge before the exam for getting qualified in the exam with high scores. A large crowd of interested and eligible candidates applied for the KMAT examination and now are eagerly waiting for their score cards. Now as per the latest updates and news, they can check their results which are going to be out within few hours. The test is basically for the candidates who wishes to take admission in MBA, PGDM and MCA based courses. Throughout the Karnataka state, over 169 business schools prefer the KMAT scores of the candidates in the admission criteria. The exam enables the applicants to know their skills regarding the consideration for admission process in various B-schools. Over thousands of students try to qualify the exam for their better future. The candidates prepare with great hard work and put their best efforts for clarifying the examination and achieving high scores. • Open the official website, namely, ‘www.kmatindia.com’. • Press on the link which shows ‘KMAT 2016 Score Card’. • Press on the ‘submit’ button. • Make a download for the same. Stay tuned to The Reporter Times for latest education news and all other government jobs updates across the nation. Previous articleGoogle Nexus 2016 Release Date and Specifications Rumors & News: HTC Sailfish aka Specs Leaked?